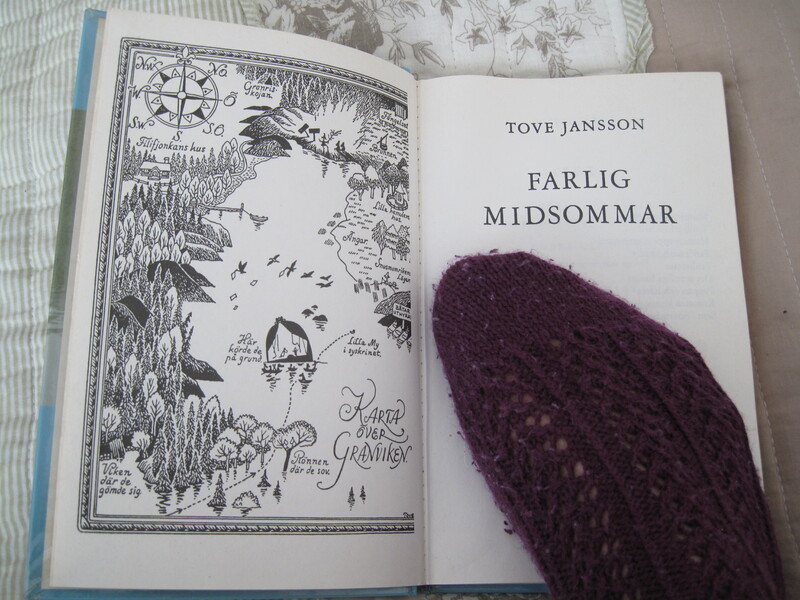 I read this book in Swedish, which is also the original language of the book, and like my blog title says, the title of the book is then Farlig midsommar, which means dangerous midsummer. I’m telling you this because this means that I can easily count this to the “What’s in a name“-challenge for a category of a book with a party or celebration in the title, as that is definitely something that midsummer is in Finland and they do celebrate it in the book too. I only noticed I could use this for the challenge right after I finished the book, so that was sort of a bonus for reading it. I just picked it up as I was actually looking for some of Roald Dahl’s books in the library for going nostalgic and seeing how I like those books now, which I loved in my childhood. But then moomin caught my eye too and out of two or three I picked this up as I remember this story as one of my favourites. I remember this better from TV than actually reading it, and I’m not sure if I ever completely read any of the moomin books as a child (except the picture books), but I know I’ve read at least part of this and the November one. That one I think is a bit of a slow one and quite different and was maybe never part of the TV series stories. I always liked this story anyhow and it’s one that has stayed in my mind best of the moomin stories. As I remember it, the TV adaptation is pretty accurate, but when reading you get more of those funny little quirks there are in this. I did enjoy this a lot and I was really happy I picked it up right now. So like I said, the moomins are dear to me since childhood, so that might be one reason that this felt like such a great feel good book and that I enjoyed it so much. It was nice and comforting to read while having a cold. At some point I also got the feeling that this is really a part of my culture and telling something about something that is familiar to me. It’s a fantasy world, at least partly, and we don’t have volcanoes over here, but still in some ways the author’s origins from Finland come through in the writing. There’s just some feeling from her descriptions of summer evenings and such. If you didn’t know, Tove Jansson was a Swedish-speaking Finnish author and artist. She started more with visual arts and I think moomin was first a comic strip in a newspaper or magazine before she started writing the books. So moomin both as words and pictures are her creations. The story in this books is about a great flood that happens close to midsummer. The Moomin-family and some of their friends, who are at their house at the time, get surrounded by water. The water just keeps rising, so after they have had breakfast, which they’ve dived for from the kitchen, they save themselves and the best furniture to a house that’s floating by, which turns out to be a theatre. Because of some accidents part of them get separated later on and have some adventures of their own away from the theatre, and in the end everybody of course find each other again. I don’t think I’m spoiling it by telling you that. Apart from my nostalgic feelings and feelings about places, it really is a nice book in many other ways too. I love the characters and the way they react to things. There’s also a nice theme of everyone finding something that suits them in some way in the end. You might not like them at first, but then you find out that something at least suits them and the characters just have different ways of seeing things and different principles guiding them. Many things just make me chuckle at how they react. They are mostly quite one-sided and even caricature like, but that just makes it more fun how they each react to things. Like moominmamma is just worried about her laundry and furniture and acts happy even when she’s supposed to be sad in the play, and it’s just fun how they all (or most of them) take everything quite calmly as it comes although they might show some initial fear or surprise. Of the characters, who cannot love Little My! She is definitely my favourite and often it’s her who keeps doing something weird in some corner (or pocket) while everybody else goes about doing ordinary things. I didn’t really remember her sister that well, but I quite like her too and she seems to have almost as much spirit as My. I have the whole set of the moomin books somewhere at my parents’ house (which, yes, I did never read completely), a boxed set in fact, and now I really feel like looking them up sometime soon and reading them all through. Like I’ve said before I haven’t read them all before, although I’m familiar with most of the stories, so I can’t really confidently say which one is the best, but if you’re looking into starting reading the books, this one is a good contender. It’s not the first of them, but it doesn’t really matter and you really get to know the characters and the world quite well here too. The very first book doesn’t seem to be quite as well recommended and I don’t think it’s even in my set. That’s The Moomins and the Great Flood/Småtrollen och den stora översvämmningen And that’s quite a different flood from the one in this book. Finn Family Moomintroll/Trollkarlens hatt (what a strange title translation by the way) and Moominland Midwinter/Trollvinter are a couple of others I remember the stories of and remember I enjoyed as a kid in whatever ways I came across them. Also to round off my moomin recommendations, just don’t forget the lovely picture books Who Will Comfort Toffle?/Vem ska trösta Knyttet? and The Book About Moomin, Mymble and Little My/Hur gick det sen? These are big favourites in Finland and picture book classics. I remember loving at least Hur gick det sen? though I’m not sure if that was also because of the story and pictures or mainly because each page has a hole that fits into the illustration, through which the characters supposedly pass to the next pages. And of course there are the comics too, though I’m not that familiar with them. 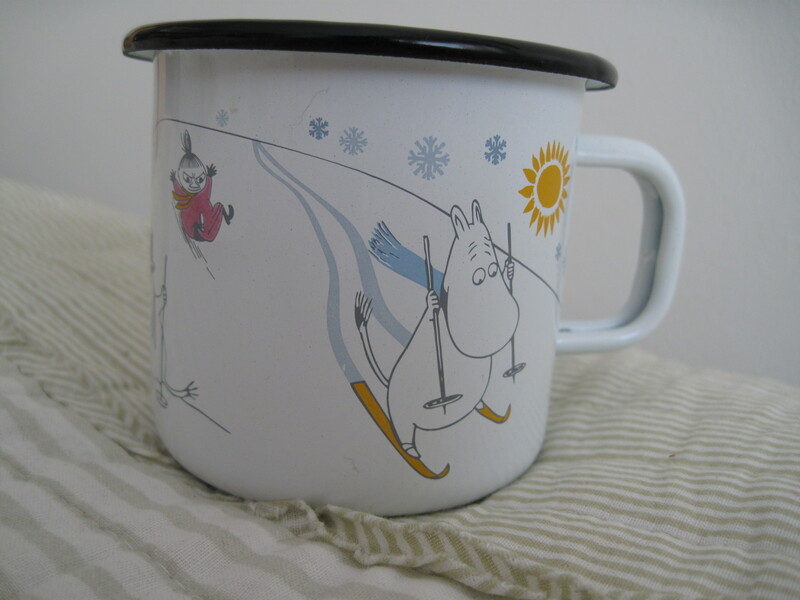 I posted a picture of a Moomin mug I have above. I have another one too, which is also over at my parents’, and that one is with only Little My I think. There is a lot of Moomin stuff around, but especially of the mugs, which many people collect too, because there is often one new each year and sometimes some seasonal ones. I’m mentioning this, because I thought it was funny how I actually remembered some of the illustrations from the book better from the mugs than anything else. Like a picture of My that’s on the other mug I have is from this book and I remembered especially another one of Mymble’s daughter (My’s sister) from another mug. 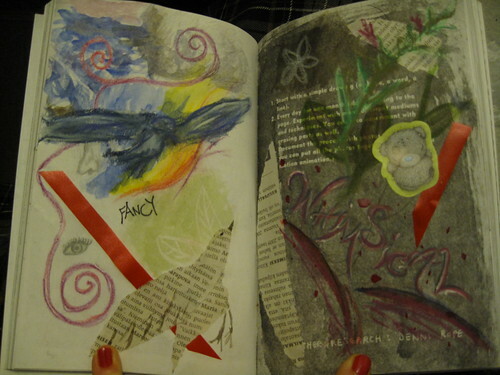 Some pages I’ve done in Wreck This Journal 1 a while ago already. Above: I might have said before that I started to draw different kinds of symbols on the empty pages in the journal at some point. Here we have Leo to the left and you can see a bit of a compass rose. It’s further on in the journal, but must have been drawn after the right side page here so it has coloured off on the left side. 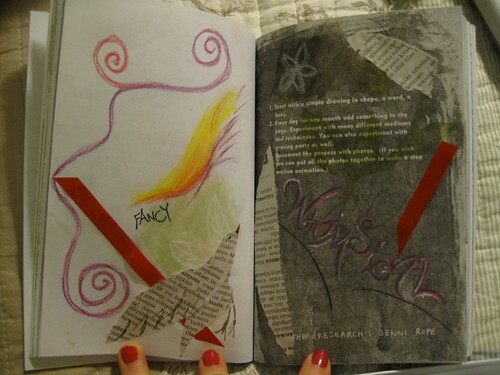 The right side page is my Pottermore name in picture form. It’s the one I got at the beta stage, but I got another account later too. Something about amusement parks around the world. 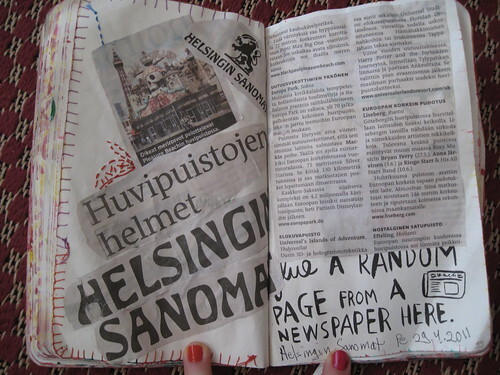 Helsingin Sanomat is the biggest newspaper in Finland. That doesn’t require that much explanation I suppose. There are different languages though. 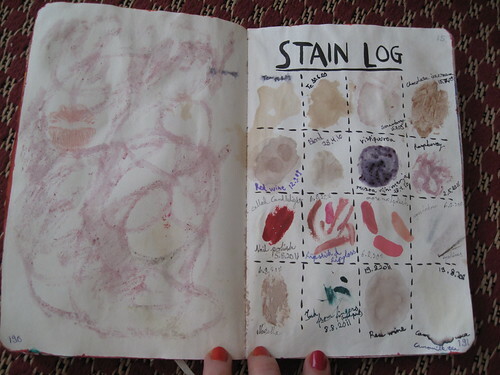 Stain log. First row from left: tea, tea, strawberry, chocolate ice cream. Second row: red wine, blood, vispipuuroa, raspberry. This row might need some explanation. Blood I remember is from when I had one of my wisdom teeth pulled out and blood was still occasionally sipping through when I was at home. Vispipuuro (fin) I don’t know what it’s in English, but it’s a sort of smooth whipped porridge made of semolina and berries, usually lingonberry but here black currants which isn’t unusual either. Then to row three: nail polish, lipstick and lip gloss, nail polish and eyeshadow and eyeliner (eyeshadow’s come off a bit). Last line: Nutella, ink, red wine, camomile tea. Nutella seems to be falling off the page. The left page I think is mostly raspberry. 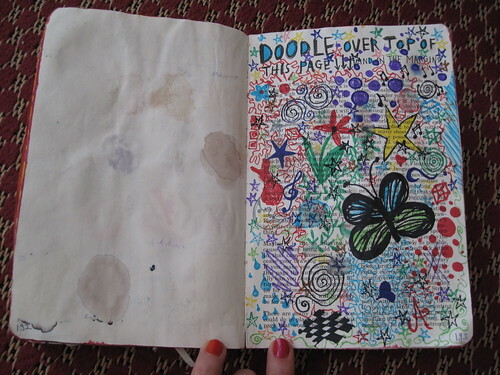 So yes I did doodle all over the page. 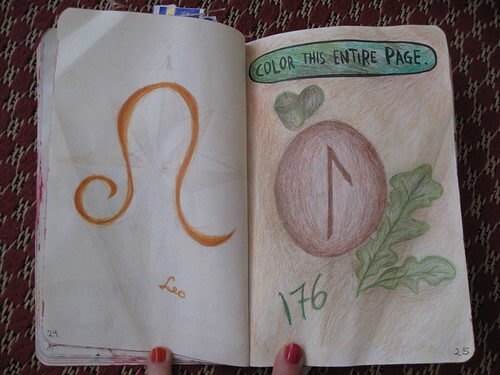 This is right after the stain log, so that’s why the left page looks a bit stained. And by the way, here I think you can notice how the nail polish on my fingers is two different colours. I had the more orange on all of them, but then it started to peel off from the pointer fingers most, so I tried out my new colour on them. This was both better and somewhat like I expected it to be. I had heard good things about this and thought that it would be a fun read, but at the same time the concept of it made me think that it would be a bit chick-lit like and therefore maybe not that memorable. So very shortly about the plot. 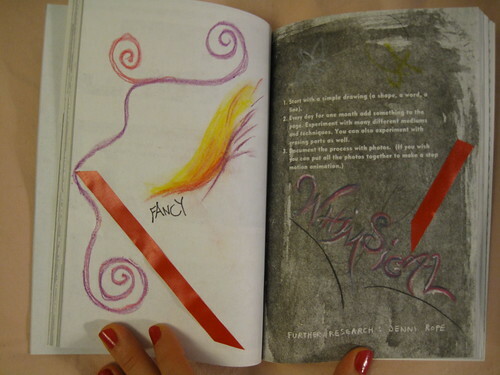 The book is about a girl, Cassia, who lives in a very controlled society in the future. (This is a dystopia too.) People can choose to be matched, which means that when she is 17 the society will choose a match for her who is most compatible with her. She get’s her match but then finds out that her match could be someone else as well. She doesn’t let go of this, like she should and that leads to her having more secrets from the society than she should, and at the same time Cassia learns more and more about her own society. The beginning was, what was promised, with the matching and the conflict of the main character, Cassia, starting to like another boy too. And that was pretty exciting/kept me reading. But then it goes deeper than that and little by little the problems with this society are highlighted more and more. What at the start seems quite light, happy and peaceful, although quite restricted in many ways, turns out darker and more threatening as the story progresses. At the same time the main character grows and learns as she discovers new things about her society. There are some things that I can think are nice about the society, for a moment anyway; it being that easy to find the person you are compatible with (though the problem is that you then don’t have a choice, plus you can’t get anyone who’s a different age from you) and someone else making sure you eat exactly what you need (though not being able to get a treat every now and then when I want to would not be nice and me being a picky eater I can see many issues with this). So although much seems pretty bad in the end I can see how this could happen and how people could live in it being fairly content, especially when the average person doesn’t know of many of the problems in the society. 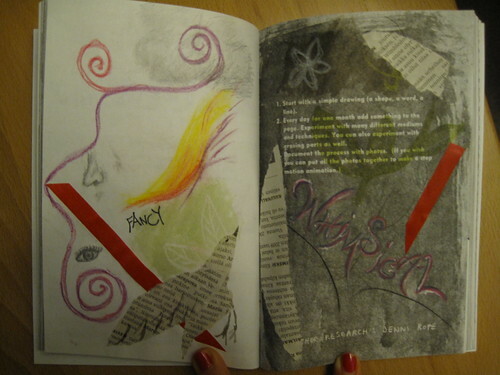 One thing I find quite interesting and also the scary thing in the book, is the repression of art and culture. What if there wasn’t many works of any art form and what if there wasn’t any chance you could produce some art yourself? What if nobody wrote by hand and what if there wasn’t any cursive, seems a bit too close for comfort though… The book focuses a lot on poetry of the art forms and I don’t have any issues against that, but the “do not go gently” line keeps being repeated a little too much for my taste. It started to irritate me a bit in the end as it seemed like it did not always fit quite right where it was repeated. As an art form I keep missing any mentions of dance as that’s close to my heart too. Maybe they don’t dance at all or they have a couple of allowed dances. I don’t know. I heard before reading this that there’s the love triangle, but I don’t see there being much of a question about who she loves of the two boys. Though that’s not an issue for me. The bigger issue Cassia has in this is how to spare one boy’s feelings, and that is written pretty well. Like I said, Cassia grows along the way, and the characters too are quite well written in general in the book. There aren’t that many we get to know well, but we get hints that most of them have more than one side to them. I really like Cassia’s family. -> I wrote most of this review a couple of days ago for Goodreads and just added some stuff for the blog. Here I have to add, after thinking about it more and starting to read the next book, Crossed, that the guys, Ky and Xander, really are a bit thin at this point of the story. I however do like how Cassia’s family is written. They’re not that big in the story, but most of their appearances in it really add something to them and they are also characters you really want to stand behind. It’s already probably quite clear that I liked the book. I did. There is just something in the writing that leaves me feeling a bit like I’m left at the surface and that with something more I could get deeper into the story. Let’s see what the other books in the series bring. By the way, after reading two young adult dystopias pretty close to each other, this one and Divergent (which I reviewed in a previous post) I can say that I do like this more of the two of them. If you compare them, Divergent is more action packed of the two, but I feel like the world of Matched adds up better and the issues come up in a nicely much more subtle way. And as to a slightly different thing, my challenge of trying to read more of my books than buy, is not going that well, because in addition to Matched I bought the two other books of the series as well. And by the way, isn’t that book cover pretty? The two others are nice as well, but I like the cover of the first one most. I’m not however a fan of disfiguring the letter A like that. Today, I saw a sign outside a restaurant/pub, which said something like “Today is Match night!” For a moment my thoughts went to this book and I couldn’t think what else it could be. Turned out it was football (soccer). 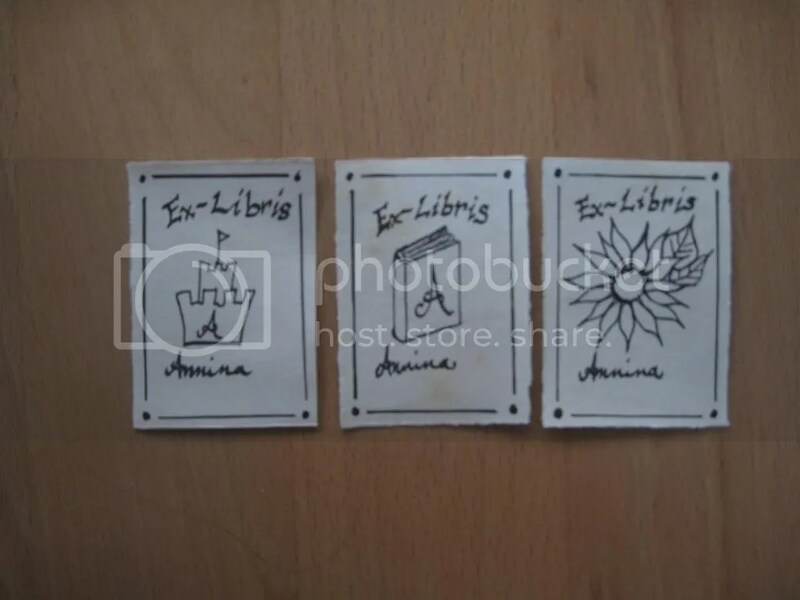 I’m not sure where I suddenly got this idea and if it was the bookmarks first or the Ex-Libris. It however just started happening in the end and soon I noticed I had lots of these things. Maybe it was that I bought a calligraphy pen at a clearance sale or maybe I saw an ex-libris somewhere and thought that I want to make my own. I don’t know. I was caught up in it and although it’s less than a week from when I started, I forget. 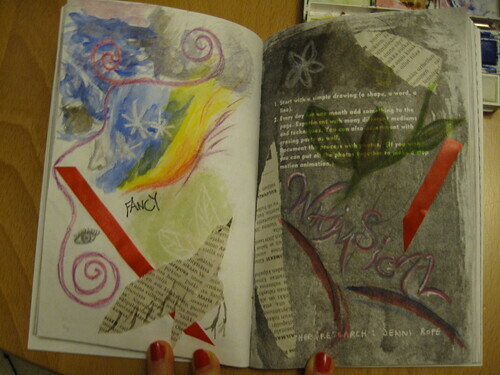 Anyway, what I started to do is bookmarks and Ex-Libris. Some of these aren’t quite finished yet, but all of these are mainly finished with the writing and drawing parts apart from some colouring I want to do on some. Here’s first my Ex-Libris. I’ve done three different pictures. I coloured some of the pictures, but I think I want to leave most of them black and white. These are before adding my last name to them. These are made with the calligraphy marker, but like the bookmarks, I did some of these too using black ink with a dip pen. Ex-Libris. Now I just need to put them in books. Sorry the picture isn’t that sharp. I do like the calligraphy pen, because it’s pretty easy to make text look a bit more stylish. Not that I’m that good at using it yet in the best way. But in the end I like the ink ones better I think. It takes a little more effort, but somehow I think that shows too. Moving on to bookmarks. 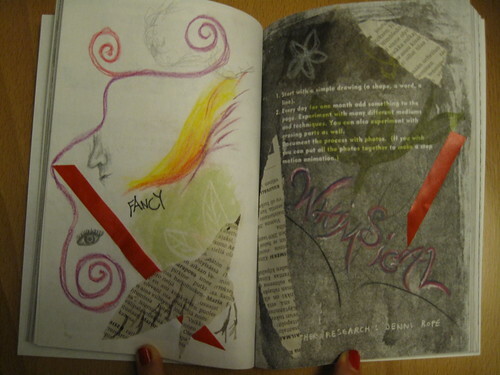 Like I said, some of them are made using ink and dip pen and some using the calligraphy marker. All the paper, except the backs of the bookmarks (obviously) is the same watercolour paper, but some of them I coloured more yellowish using tea. That idea I got from this blog: http://fracturedarts.wordpress.com/2012/08/08/staining-paper/ As I didn’t need that big sheets of paper in the end, I cut them down to A5 size first and then it was pretty easy to let them soak in the tea for a while. 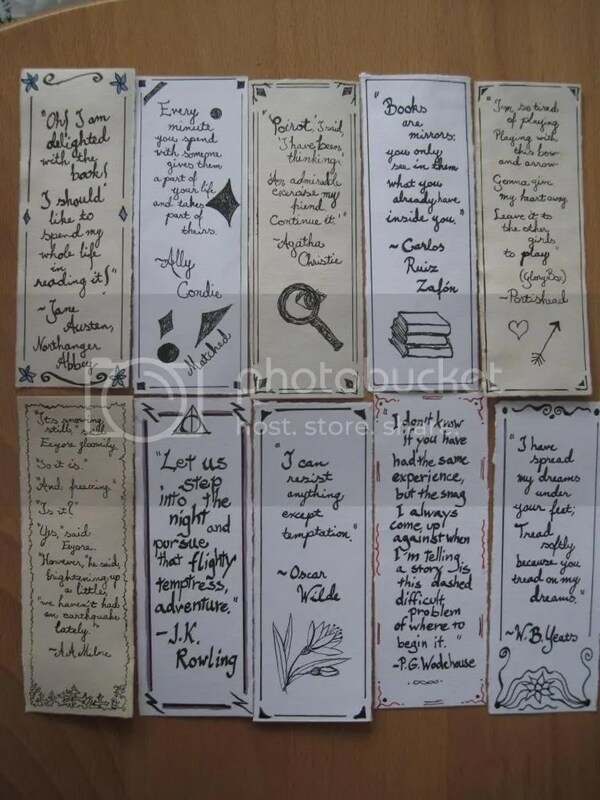 (So the bookmarks are as high as the shorter side of an A5, meaning I get four bookmarks from an A5). 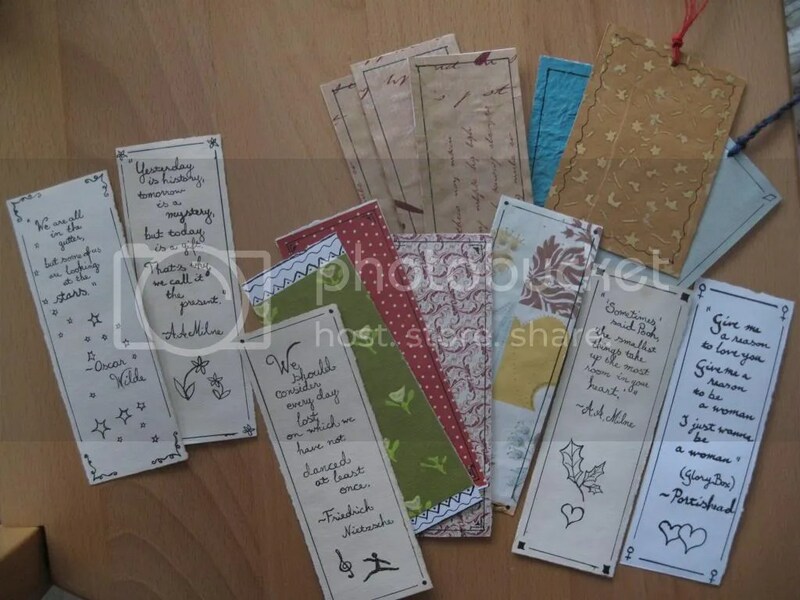 For the backs of the bookmarks I used some different papers. A couple of craft papers, but mostly gift wrapping paper, which is the light brown with writing on it, and the one with different coloured squares with patterns is also a gift wrapping paper. I actually bought the brown paper with the writing for this, and as I was looking around the art supplies section I came across some watercolours and couldn’t help myself, but bought the claret colour (pointing to name of blog) and some lovely coloured papers for card making/drawing (pretty good quality, should be nice for soft pastels or colour pencils as well). Yes I have a slight weakness for art supplies even at times when I’m not that actively doing art stuff and don’t really need them. 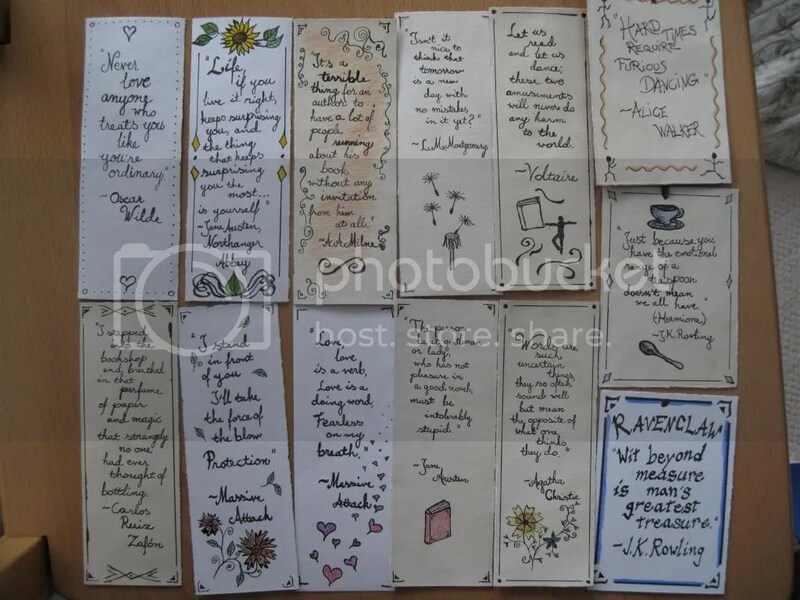 Still about the backs of the bookmarks. The dotted paper and the one with a pattern of the same colour to the right of it would be pretty nice for this too, but I bought that paper for another project quite some time ago so I don’t know if I can buy more of it and I’m not sure of how much extra I have if I still continue with that project. That project was making a set of tarot cards. Not that I really do much anything with tarot cards, but sometimes I like that sort of things and then I forget about them for a while again. 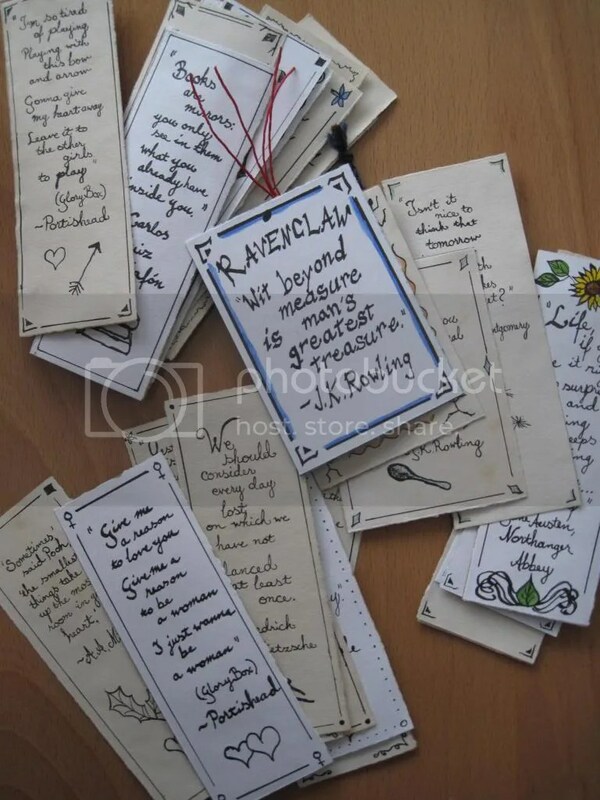 The quotes on them are mostly from literature or writers, but there are some with lyrics too. My current trip hop listening is showing (Massive Attack, Portishead). If you’re curious about one of the quotes and can’t quite read it, just ask. I’m not quite happy with all of them so I might redo some of the quotes. Like the Northanger Abbey ones look quite sloppy and I want to do them in ink. The Matched quote was the first one I did, though not that version of it. I kept mis-quoting and the first version is on the other side, and I made the same mistake on this side and the decorations became geographical shapes to hide that. Yeah, I’m currently reading Matched, so that’s why that one. I think I should read something of Oscar Wilde’s. His quotes always pop up and I really love a lot of them. Now I just need to come up with what to do with all these bookmarks. I’m a bit of a bookmark collector, simply because nice bookmarks are always great to have, but also because they are really good, small souvenirs. But I really don’t need that many at one time and using many of these takes away from using my old ones. I thought they’d be nice small gifts to add to something, but now I’ve mainly chosen quotes that I like and not specifically directed to someone I know, so I’ll have to see if any really fit or then I’ll have to do new, sort of personalised ones if I want to give them away. 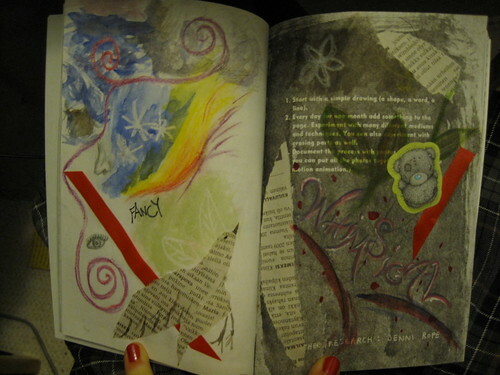 I started telling about this page in Mess This Post. I add something to the page every day for a month and record the progress. I only posted pictures of the first three days then and a lot has happened to it since. It’s not turning out to be the biggest work of art ever, but it’s a lot of fun and I’ve sort of started going through a lot of my art supplies, which is nice because some of them haven’t been used for a long time. I forgot a couple of days, so I did two things on the next day. Let’s start with the pictures. Day 4: Added more colour to “whimsical” using watercolour pencils. Day 6: Pieces of newspaper. Day 7: Watercolours. I noticed two of the pieces of newspaper looked like a bird, so I made it a bird. Above that some green to show the white crayon leaves and showing the flower on the right better too. Also some leaves painted on right. Day 8: Some plain pencil drawings. I like drawing eyes and noses. The thing at the top of left page was supposed to be a cloud. Day 9 – This is where I forgot and I think I did this on day 10 actually. I just basically erased some from the previous day and added a little to the “cloud” part I think (making it uglier). Day 10: Watercolours. Haha, this is when it gets messier. The “snowflakes” by the yellow are from crayon day. The blue was going to be some sort of waves. There’s more, especially of the green, on the right too. Day 11 & 12: I only remembered late on day 12, so I did something quickly. The sticker for day 11 and nail polish spots around “whimsical” for day 12. The sticker looks slightly out of place, but so do a lot of other things too. Day 13: Soft pastels again. Some of my favourite art supplies definitely. The newspaper bird got a friend as well as more greenery on the right side. And day 13 was today, so that’s that so far. There’s a lot of days, but little space, so I can see things covering other stuff more in the future. I’ll update on the progress of this later again. Relating to other blog stuff, mainly my reading, and reading challenges: I bought another book a couple of days ago. “Matched” by Ally Condie. In other words I’m not doing that well on the project of reducing the number of books I have unread on my shelves. This is where, if you didn’t know it already, you discover my love for Harry Potter. And this is where you double-check the title of this post, because didn’t she say Divergent in the title and now she’s talking about Harry Potter. Yes, you’re right about both things, but I like to connect things and HP just happens to pop up this time. Anyway, I’ll start from the fact that I did like Divergent, but then I didn’t completely like it. It was an exciting book that kept me reading and wanting to know what happens next, but there were just too many things that started to bother me about it at some point. So to give you an indication of how these things balanced out, I gave it 3 of 5 on Goodreads. That I see as pretty good but maybe still a bit bland or not so exciting or just pretty nice but nothing I will remember for long or like this pretty good in some ways, but not so much in other ways, with things that bother me that bring the rating down. Anyway, one fun thing is the factions, well in the fact that you just have to start thinking about which faction you would belong to. Well, I do at least. That doesn’t mean however that I quite agree with the factions in the book or divergence for that matter, but I’ll get back to that later. That’s one of the things that bothered me about the book. But which faction would I belong to in that world? I think Amity or possibly Erudite, but I would probably choose Amity unless I was Erudite born, because it would be a bit scary to have to be smart and scholarly all the time. To those who haven’t read the book yet, this maybe requires an explanation and something about the story. The world of the book, or well one city in it as we don’t get to know much about anything else, is divided in factions based on personality (I’ve seen it mentioned somewhere that the city would be Chicago, but I don’t remember this being mentioned in the book, but maybe it was). When they are sixteen the people have to choose a faction which they want to be full members in, as before they have just lived in the one they were born to, the one their parents chose. They do an aptitude test, which tells them which faction they are best suited for (think sorting hat, but not quite as good as that and privately), but then they get to choose any faction in the end anyway. After the choosing ceremony they move to their chosen faction for an initiation period before they can become full members. This period in the main character Beatrice/Tris’ life is basically what this book is about. The factions are Abnegation (the selfless), Amity (the peaceful or kind/friendly), Candor (the honest), Erudite (the intelligent) and Dauntless (the brave). Tris is from Abnegation, but she chooses Dauntless and goes through initiation there. There are also those who are equally suited for more than one faction and they are called Divergent, but that’s very hush-hush and dangerous, so don’t tell anyone if you’re Divergent. (I think they capitalise all of those in the book, but I hope you don’t mind if I stop that now or do that a bit randomly, because it confuses me a bit if they are to be capitalised in any sense they are used or just at some times, as they are used in more than one way.) And there are all those who fail at the initiation for some reason or maybe just protest otherwise or something like that, who end up factionless (and there must be people born factionless too). So they are basically homeless as I understand it and they live partly on charity (mainly from abnegation) and partly I think from odd jobs they can get, which there is no one else to do. So you better choose the faction your aptitude test points you towards because I’d say chances are greater that you fail on your initiation otherwise. I think Amity seems like the most sensible and nice faction to live in, though it’s the one least mentioned in Divergent. From what the end of the book hints I think we’ll see more of that faction in the next book. Anyway, that’s basically why I would choose it, but I also think that I have more of that peacefulness than of the other qualities. It’s difficult to say if you’re intelligent enough though, but I definitely know that I wouldn’t be brave enough (nor stupid enough to jump from train to roof or something similar), nor would I be honest enough nor selfless enough to be in those factions. So amity it is, or possibly erudite. The funny thing is that I’m always choosing Ravenclaw in Harry Potter, while I’m unsure if the hat would pick that for me or Hufflepuff. So I make different picks there. The difference though is that the houses allow for difference opposed to the factions. And that is my problem with the factions. In the book it is at some point said that most people are perfectly happy to go with one thing and only the divergent are people whose minds wander in different ways and therefore they are a danger to the society. What? Everyone else is perfectly happy to go with one characteristic, even if they might have a lot of the other characteristics too, but one is more prominent. And wearing clothes of one specific colour too. 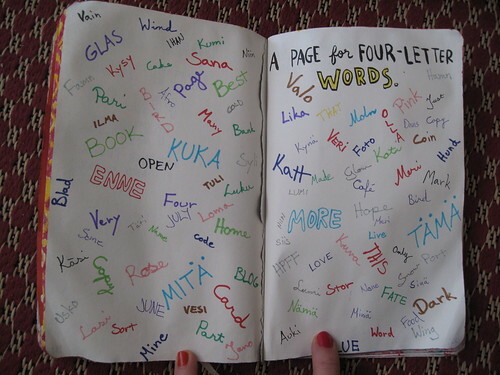 And divergent. Tris seems to show equally much of three different factions’ preferred characteristics and I can understand that that might be a bit more rare. But then there seem to be people who get one aptitude test result but are still divergent. Meaning that if divergence is rare, most people have really much smaller amounts of other characteristics, instead of having a preference for one thing but some others pretty close? I find that just a little unbelievable. 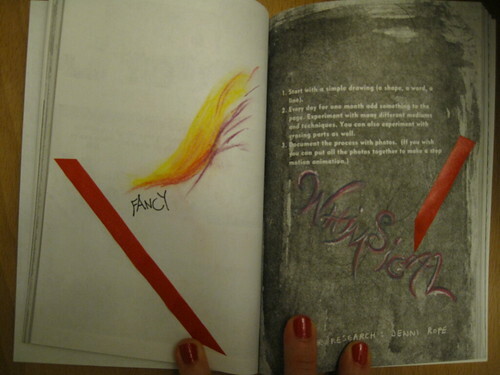 Talking about this book, it’s a part of this big wave of dystopian young adult literature. Quite interesting that is. For a couple of years ago I couldn’t have known about more than three or four dystopian novels and now they seem to be everywhere, mostly as trilogies. That’s another thing too. Most popular format seems to be trilogy these days. I’m not saying I have anything against these things, I just find the popularity of these interesting. So before lately I had read Brave New World and 1984 (from which I prefered the first, though it was pretty long ago I read both). I swear I had another one in mind too a few days ago but I’m drawing a blank now. Is Clockwork Orange a dystopia? I haven’t read or seen it, but I have a feeling that it might be happening in some kind of future society that’s not very nice. Oh there’s Fahrenheit 451. I haven’t read it but I think that’s one. That’s about it I think. And now they’re everywhere. I guess there are also a couple I’ve heard of too that are from some years ago though not that old. I haven’t really read many of these new ones either. The Hunger Games (the whole series) and this one and then there’s Matched on my to-read list. And just as I’m rambling anyway; I wouldn’t call a book “City of…” right now. There seems to be loads of those books too from different authors. I was in a bookstore the other day and those City-of books just kept popping up everywhere. But I’m getting off topic again. Like I said, I sort of liked the book, as it was exciting and kept me glued to it for a while. Then there were these things, like the faction thing I talked about that started bothering me. There’s also the funny fact that they gave the government to just one faction (abnegation) and practically all specific jobs are given to specific factions. And I already mentioned the dauntless. I can’t really see them as much sane at all. The characters were pretty well written, though it being told in first person from Tris’ point of view it seems like we lose a bit of the different sides of characters through her. Or we get her view, and some characters and for example some sides of bravery don’t get the same appreciation as others. I’m thinking especially of Al here. Stuff happened at first and later too that made her not always like him that much, but for a big part he did show a lot of bravery. There was that time when he cheered on Christina, and Tris wasn’t ready to do that because she was afraid of Eric and I think there was something else similar too. I do like it though that Four seems to understand different sides of bravery. Now I keep forgetting what else I wanted to say about the book, as time passes and I didn’t make notes or anything. It’s the whole world building that is not quite flawless and leaves too many questions, that mostly bothers me. Other questions I believe will probably be answered in the next book (or books) such as what is outside the city and how do people live there, more about amity and the factionless and other such things. By the way, there must either be a lot of factionless, a lot of people have fled the city or there was a plague, because there don’t seem to be that many people there. It seems like everyone goes to the same school and I think dauntless had about 20 or a little more initiates this year, so really not many if that times five is all the sixteen year olds in the city. That’s a long and sort of scattered review. 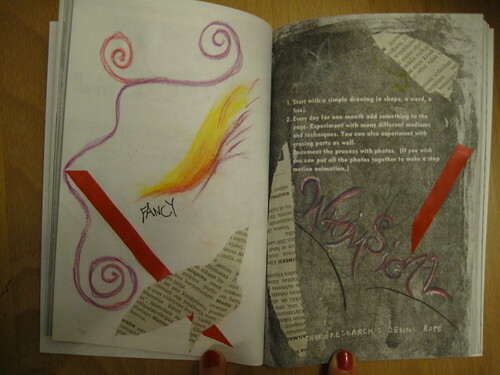 But maybe it represents the feelings I have about this book. I’m trying to be a bit more concise and clear in my future reviews though. However, do I recommend? Not directly. I don’t discourage you from reading this, but it’s not the first thing I recommend. If you want a recommendation right now from me I’d rather go back to my previous review (The Summons by Peter Lovesey) or say read The Hunger Games as something of the same genre. But if you’re looking for a quick and entertaining read, and look for something like this, then go for it. I will also read the next book in the series to see what happens. 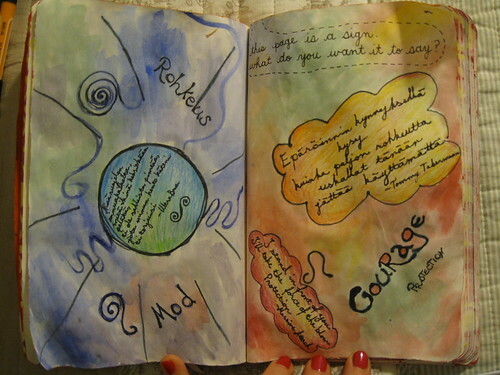 I started with the text in the yellow and orange cloud as I thought that was a nice thought, and then wrote courage and added the Leo zodiac sign symbol sometime later and the sun on the other page was added sometime then too. Yes, that was a simple sun at first; a circle with lines around it for rays. “Protection” and the two other longer texts were added a couple of days ago with the colouring inside the circle and clouds and the rest yesterday when I finished this. So it sort of just grew into this. And on the other page, there is: “Minä suojelen sinua kaikelta, mitä ikinä keksitkään pelätä, ei ole sellaista pimeää, jota minun hento käteni ei torjuisi” That’s from a song by the Finnish band Ultra Bra. It could be translated something like: “I protect you from everything, whatever you think up to be afraid of, there is no such darkness, that my delicate hand would not deflect”. I’m no translator, especially of poetry, so sorry if they sound a bit strange. By the way, I must have used another marker when I wrote “courage” than to the later big words, because it went a bit messy with the watercolours. It was better before. ;) And that paper quality is slightly annoying with water colours. Time for a book review finally! My first actual review on this blog and I feel like I don’t know where to start. Peter Lovesey is maybe a slightly less known crime writer, at least compared to those whose names you see prominently in every book store. Well at least I hadn’t heard of him before I accidentally came across the first book in this series at a book fair. But maybe he’s bigger elsewhere. I would recommend his books based on what I have read so far, at least this series, from which I have read two books. As a note at the start. This review does not contain spoilers, just general information and something about the beginning. I’m not revealing any murderers so feel safe to proceed even if you haven’t read the book but plan to. The book, The Summons, is a part of a series of books about the detective Peter Diamond, who is with the Bath (and Somerset or maybe North-east Somerset) police and then again sometimes he is not. I have read the first book in the series The Last Detective some time ago and this is apparently the third, according to what I found out about it on Goodreads. 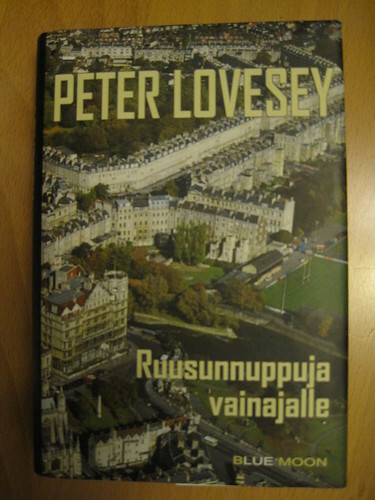 I read both in Finnish, the first as Viimeinen oikea rikosetsivä (translated: The last real detective) and this one as Ruusunnuppuja vainajalle (translated: Rosebuds for the deceased). Apparently the Finnish publisher skipped the second book in the series for some reason and only these two books have been translated so far. I shall have to see if I find more somewhere in English. (And after writing the first part of this post earlier I checked and the library does have some of these in English.) These books are not sensational or action packed, but there is some action parts too so they are not quite classic detective leisurely either. Something in between though I guess. The not so athletic detective has his limitations too after all. I really quite liked this and the first book in the series. It was almost great, but not quite. The story pulled me in, but there was something that was lacking, which made it just a little less of a pleasure to read than my favourite mysteries like Christie’s. It lacked maybe some kind of warmth in the writing that would really have pulled me in completely to everything in the book and somehow I was at least sometimes to some extent left at a bit of a distance. That’s a really fuzzy explanation, but I can’s say it better. Partly this could also be because I read a translation of the book and sometimes Finnish can be a really difficult language for translations because it’s so different from the germanic ones and something of the feeling might get lost in translation. I don’t know if that’s the case here. The story here is that a convicted murderer, Mountjoy, escapes prison. The book starts there and I loved reading the escape. Really got me rooting for someone who is partly a villain in the story. He then demands to have Diamond re-investigate his case because he still claims to be innocent. The plot is good with actually two intertwined stories going on, one with Mountjoy and a kidnapping and the other with Peter Diamond trying to solve the murder case with his sidekick Julie Hargraves. Those are intertwined quite seamlessly as they aren’t that far from each other. The only thing I was left wondering about a bit was what happened to Mountjoy’s prisonmate’s old girlfriend, who he visited. It sounded like he wasn’t that happy with her in the end and she probably had a lot to explain to her husband with broken windows and stuff. I liked the mystery. I sort of did figure out, or actually guess, the murderer sometime before the revelation, but after that I was tricked at least twice to think that they had found another murderer. I think it’s a kind of fair mystery, where some hints are given, so even if you can’t figure out the whole thing, you can pick up some hints and make at least an educated guess based on them. Though there are of course red herrings too. I like the character Peter Diamond. He’s both likeable and sometimes unlikable at the same time. I remember that in the other book I didn’t always like him that much from the start because he wasn’t that nice to others, but then it turned out to be someone else who wasn’t loyal. I just read another book, The Delegates’ Choice by Ian Sansom, where a character’s (Ted) sometimes similar grumpiness to Diamond’s and complaining about new things started to annoy me a lot in the end, but here it just gives personality to the man and the character manages to be likeable at the same time. I like his partner in the investigation, Julie, too and I hope she is in the next ones too. I would recommend these books and I hope I get the chance to read the next ones in the series as well. Annina has read 6 books toward her goal of 50 books.